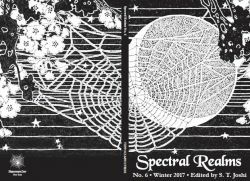 Many thanks to Michael J. Abolafia for his fabulous review (Spectral Realms 6) of the October 2016 issue of Eye to the Telescope—the “Ghosts” issue—which I guest-edited for the Science Fiction & Fantasy Poetry Association. Abolafia gives special shout-outs to poets L.W. Salinas, Holly Walrath, Suzan Pickford, Daniel R. Jones, Joe Nazare, Christina Sng, Andrea Bylthe, Jessica Horowitz, Lauren McBride, Ann K. Schwader, John W. Sexton, Rebecca Buchanan, Jane Yolen, James Edward O’Brien & Alex Harper.